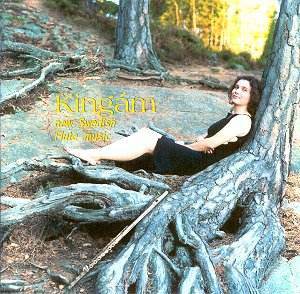 Kingám - New Swedish Flute Music. Here is a real cracker! And I don�t primarily allude to Kinga Práda as cover girl of this CD but rather to her fantastic playing and her choice of music. I already hear the grumbles: "New Swedish Flute Music"! Anyone knows what contemporary music sounds like ... and Swedish at that. No thanks! But wait a moment. Don�t stop reading yet. Let me explain. Look at that cover picture � that�s what the music is like: beautiful and classically elegant as Kinga Práda but relaxed and inviting and in a setting that is just as contrasting, mysterious and full of unexplored possibilities as the wild nature surrounding her. The mastermind behind the disc and also composer of most of the music is the indefatigable Stellan Sagvik. Kingám is Hungarian and means "My Kinga". The two met in Cluj ten years ago and they took a fancy to each other. To lure her to Sweden Stellan wrote this piece for flute and percussion, and it worked � today they are married! Dripping water is the starting point, which also has an explanation: one evening when Stellan called Kinga was in the bathtub. The germ of this music � and the germ of life � is water, and out of this dripping the flute softly sneaks in and joins the percussion in an ever wilder dialogue; a lyrical section with beautiful flute garlands leads over to a kind of interlude, dominated by ominous percussion, then a thrilling rhythmic finale and � a full stop. Marvellous music. Tommie Haglund�s Fragile is exactly what the title implies but there are also more earthbound reminiscenses of Nordic folkmusic. Look at the cover again! When Vampire State Building was premiered in Germany in 2001 the original title was impossible to use, after September 11, so it appeared as Flute Status. The vampire reference was obvious since both Kinga and her mother who plays the piano part, are from Transylvania. This is a more sprawling composition with heavy rhythmic accents but also strands of baroque counterpoint. For Martin Larson�s Boughs look at the cover picture again but raise your eyes as it were and imagine the boughs above. "This piece is about climbing trees", the composer says, adding: "I think." It starts with eerie sounds from the flute and marimba in unison. It is slow-moving music, sometimes a flute phrase peters out from the fabric of sounds that changes colour when the flute climbs higher and higher "through the network of leaves". Sagvik�s Flute Concerto No. 1 was in all essentials composed in 1971 for full-size symphony orchestra but was reworked and reduced to strings only the year after "when I was much older and maturer. It still had to wait another 24 years for its premiere performance." It is serially composed and constantly changing: aggressive, dancing, cathedral-like. In the middle of the piece there is a long cadenza like section for unaccompanied flute, improvisational in character and giving the feeling of open air music making (see cover again!). Originally written for clarinet and vibes, B Tommy Andersson�s Impromptu is equally well suited to the flute. Idyllic, melancholy, pastoral are the prevailing moods but the middle section is eagerly rhythmic. Solar Plexus is another work from Stellan Sagvik�s late teens but this time radically rewritten in 1998. Its aim is to comprise the whole solar system; in addition to the seven planets in Holst�s famous orchestral suite, Sagvik also includes Pluto (although astronomers today debate whether it is a "real" planet). Then we must add our own Tellus plus the asteroids and at the centre of it all, the Sun. It is technically demanding and at 24 minutes a real tour de force for a skilled player. Each planet is given its own individual character: Jupiter is big and bold and turning slowly while the Asteroids are shattered into a kaleidoscope of fast-moving fragments. Pluto, the most distant of the planets, is also the most difficult to perceive: lots of space around the notes until it disappears out of view. The final Nocturne is a beautiful folkmusic inspired hymnlike tune, played here as a kind of encore, and we are back again in the cover picture. Are you still with me? Don�t you feel like following Kinga on an expedition through "the undiscover�d country from whose bourn each traveller returns" uplifted, renewed? The musical sceneries to which she will guide you are full of surprises, beauty, rhythms, changes, meditation � always alive, always thrilling, like life itself! In plain English: Recommended to anyone except the tone-deaf.